Home / Uncategories / We Love Paleo Movie - Don't Just Go Paleo, Grow Paleo! We Love Paleo Movie - Don't Just Go Paleo, Grow Paleo! Is 2014 the year of Paleo? Despite the explosive growth we've already seen in the Ancestral Health community, there is ample evidence to suggest that Paleo big and only going to get bigger in the coming years. Evidence in support of this can be seen by the number of celebrities "coming out" for Paleo; Jack Osborne and the San Francisco Giants' Hunter Pence to just name two. There has also been a substantial increase in the appearance of Paleo (or simply "anti-grain") books popping up on New York Times bestseller lists ("Wheat Belly", "Grain Brain" and "Practical Paleo" are of particular note). "...According to our experts, consumers will continue to lean on wheat-deprived diet plans like the Paleo diet, gluten-free or "wheat belly" in 2014. "Despite the lack of evidence to support wheat- or gluten-elimination diets for weight loss or health – not associated with a clinical disorder or disease – consumers are still looking for ways to control their weight," explains Jenna A. Bell, PhD, RD, Senior Vice President and Director of Food & Wellness at Pollock Communications. Just over half of the respondents agreed that the Paleo diet, gluten-free or "wheat belly" would top the list of most popular diet fads for 2014." -PRnewswire.com, "14 Top Diet Trends For 2014"
However, Paleo getting bigger doesn't necessarily mean we are on the cusp, of taking this thing mainstream. Last year, my friend Hamilton Stapell concluded in his AHS Presentation ("The End of Paleo: Is the Ancestral Health Movement Going Mainstream? I Wouldn’t Bet on It!") that ingrained cultural, physiological, and social obstacles will keep Paleo from reaching the critical "tipping point" necessary for mainstreaming to occur. By Hamilton's estimates, there are approximately 1 to 3 million people who identify themselves as "Paleo." To put that into perspective, based on a recent Gallup study the proportion of American's identifying as "Vegan" (2%) and "Vegetarian" (6%) translates into 18.8 million and 6.2 million respectively. With a combined 8% of the population following a plant-based diet, that would up them below the threshold for "early adopter" status. 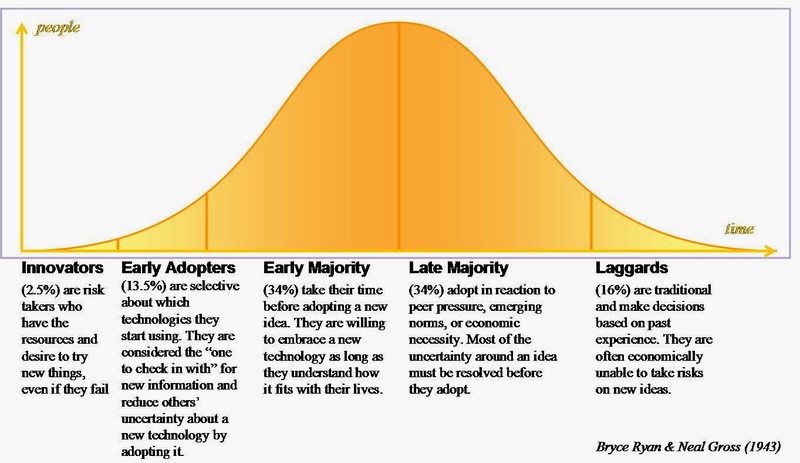 With, at best, 1% of the population following the Paleo diet, we haven't even hit the "innovator" level. "I think being different, going against the grain of society, is the greatest thing in the world." You hear that? Going "against the grain", he said it right there! Frodo is Paleo! If you've decided to ditch grains, buy stock in a grass-fed cow, scoured your local grocery store or farmer's market for fresh local produce, or secretly prepared gluten-free treats for your family and friends just so you can shout, "See! You didn't even notice!" you know how great it is to go Paleo. You're probably feeling pretty energetic, maybe lost some weight (or even gained some muscle), perhaps that pesky auto-immune condition has cooled down, or your sports performance has improved. All in all, you're rocking like Grok and loving Paleo. So what can you do to keep this Paleo party going? Growing up in Quebec Canada, filmmaker Caroleen Moise Reimann recalls dinnertime at her childhood home, "Literally every meal was served with several cups of rice or macaroni bakes." She remembers that her mother would complain of digestive problems, but it never occurred to her that there was something wrong with their diet, rather, she assumed something was wrong with her mother! Fast forward several years and Caroleen is training as a collegiate fencer. Rigorous workouts were paired with low-fat/high-carbohydrate diets. Recommended by her coach, she ate tons of beans and chicken breasts, and, although she often felt bloated and uncomfortable after eating these meals, she assumed that, like her mother, there was simply something wrong with her. It wasn't until she hit her early 30's, and pounds began to creep on, that Caroleen decided to finally reexamine her notions about nutrition. She searched the internet for clues and, suspecting she was gluten intollerant, found Mark Sisson's "The Primal Blueprint" on Amazon. She read "The Primal Blueprint" in only a few days and immediately began to implement it's recommendations. Dry chicken breasts were swapped for bacon. Beans gave way to nutrient dense eggs and fermented dairy. She piled on the veggies and rounded things out with some fruit and nuts. "I just felt 'Wow! '", she said about her Primal transformation, "I'm so much better!" Having produced several short films, Caroleen realized that her passion for creating a full-length feature could combine with her new passion for Paleo. She knew there was a need to put information about the Paleo lifestyle out into the world because she was constantly fielding questions from concerned friend and filmmakers who thought her cholesterol must be terrible from eating all those animal products, and what about all the "nutrients" she was missing out on by eliminating grains? After assembling a production team, she turned to the Paleo community and confirmed interviews with Loren Cordain, Paleo Magazine editor Cain Credicott, PaleoFX creator and chef Michelle Norris, and author of "Paleo Fitness" Darryl Edwards, just to name a few. The only problem, is that they needed one special person. Ok, so that person is you. Producing a movie isn't cheap, and, as we already know, Paleo isn't so big that deep Hollywood pockets are turning themselves out to fund projects like this. But, the beautiful thing is that you can! 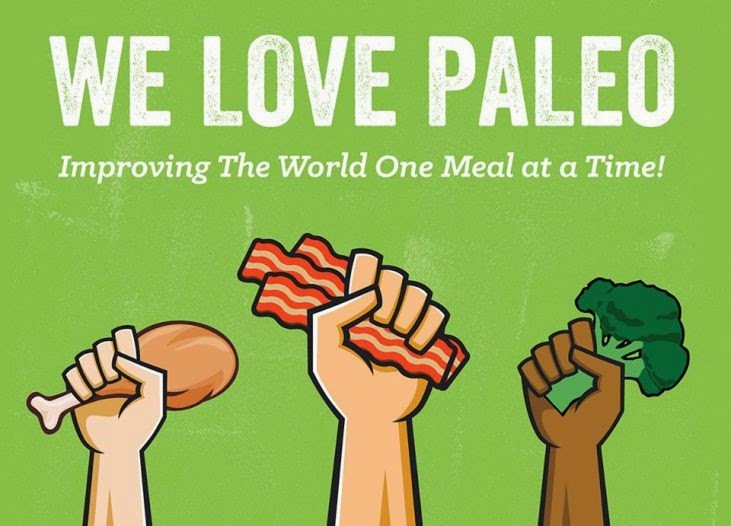 For the price of a kombucha tea, bag of kale chips, and grass-fed burger you can make a significant contribution to getting "We Love Paleo" off the ground and onto the big screen. Films like this need to be made. The good word of real food and honest living can't be kept a secret and movies are a powerful medium for winning the hearts and minds of skeptics. Take that passion you have for Paleo, and put it to action. Find out more about this exciting new movie by reading the info below and watching the teaser trailer. Once you're sufficiently convinced that you can spare a few bucks, head over to their IndieGoGo.com crowd-funding page to make your contribution. "Each and every one of us has (or knows) a friend, relative or acquaintance that is either diabetic, overweight, has chronic heart disease or God forbid, all three at once. Then, there's the rest of us who think we lead healthy lives, conducive to well-being and longevity. The thing is, most of these ''healthy lifestyles'' aren't healthy at all! This, summed up, is what drives our whole team to make this film. The topic of this film touches everyone. Our dearest wish is to engage people and inspire them to adopt healthier lifestyles. The healthier the world gets as a whole, the better off we will all be. A few stats that make our documentary on Paleo—a diet that has been scientifically proven to revert most lifestyle diseases—even more relevant!"